One objection to the earth being only 6,000 years old as described in the Bible is the claim that the coarse-grained texture of granites shows they cooled slowly over millions of years. Sceptics allege that if the magma had cooled quickly, the texture would have been a fine-grained lava-like rock or even a volcanic glass. However, this objection is based on the false idea that grain size depends solely on cooling rate. Granitic dykes and pegmatites are well-known examples of granitic rocks that formed when cooling was more rapid than the cooling of a pluton. Also, large fine-grained rhyolite bodies show that coarse-grained texture does not necessarily form when cooling is slow within them. Crystal size depends on many factors, including nucleation rate, viscosity, original composition of the melt, pressure variation and the amount of volatiles. In fact, fluid inclusions in crystals within granites and the lack of evidence of crystal accumulation in the granite plutons indicate that crystallization occurred quickly. Another evidence of rapid crystallization is the presence of radiohalos of short-lived isotopes of polonium in biotite and muscovite crystals in granite. Rather than being a problem for rapid cooling, the crystals point to rapid crystallization. The Tatoosh pluton in Washington State is an example of a shallow granite pluton that crystallized quickly after rapid reduction in vapour pressure due to a sudden loss of volatiles. This is exactly the opposite of the conventional ideas on which the sceptic’s claims are made. One of the many objections to the earth being only 6,000 years old as described in the Bible is the idea that large bodies of magma (molten rock) need millions of years to accumulate and cool.1–4 Today huge volumes of once-molten rock, called plutons, are exposed at the surface of the earth, having been unroofed by erosion of the overlying material (Figures 1 and 2). Most plutons intruded into the upper crust are of granitic composition. That is, they are comprised mainly of the light-coloured minerals, the feldspars and quartz—a composition often referred to as ‘felsic’. Although dark minerals such as biotite and hornblende are usually present, giving the rock a speckled appearance, they are never abundant. It is important to remember that such objections to the young-age for the earth are not based on observations, but on assumptions about the past. The behaviour of magma deep in the earth in the past is deduced from evidence observed at the surface of the earth in the present—evidence such as field relationships, laboratory experiments, thermodynamic modelling, and isotopic measurements. All conclusions about magma behaviour depend directly on how the researcher interprets his observations, and his interpretations are constrained by what he already believes about the past. Such beliefs (or assumptions) cannot be checked or proven because no-one has ever monitored the cooling of a pluton as conventionally described. First, the body of magma is inaccessible to direct observation because it accumulates deep (supposedly) inside the earth. Next, the process supposedly occurs over a time frame of tens of thousands to millions of years, far too slowly for changes to be measured. And then, the events occurred in the past, millions of years ago it is claimed, but no-one was present to observe them happening. Figure 2. Part of a granite pluton exposed at the surface. Bald Rock, Tenterfield, New South Wales, Australia. Hayward2 illustrates how arguments about the cooling of intrusions are based on assumptions. A persuasive unitarian critic of young-earth geology, he gives the impression that the igneous-cooling issue is an open-and-shut case. He argues that ‘The mathematical laws of cooling are well known, and have been confirmed by countless experiments. Consequently, it is not difficult to calculate how long it must have taken an igneous intrusion to cool.’ He then quotes minimum cooling times for various igneous bodies, all of which are greater than 6,000 years. However, he fails to mention that these calculations all assume that the cooling is governed by conduction alone—conduction from the magma chamber into the surrounding rock. That cooling entirely by conduction would represent what occurs in the real world is unlikely in the extreme. Geologists have long recognised that fluids have played a crucial role in the emplacement and cooling of magma inside the earth, and different sources for the fluids have been identified.5 Those originating from the magma itself are called magmatic and hydrothermal fluids and those from the country rock are variously called meteoric fluids, and connate and ground waters. During the global Flood of Noah, water would have been especially abundant! More about fluids later. The question of how granite plutons could have been emplaced, cooled, and unroofed in a couple of months has been soundly answered in a number of geological papers by Snelling and Woodmorappe.6–8 The key is to interpret the data within the framework of the global Flood. First, there is no problem with rapid emplacement of liquid magma—it occurs via dykes due to crustal movements and can happen quickly.9,10 Interestingly, even the atheist Henke, in his attack on the work of Snelling and Woodmorappe, had to admit: ‘Geologists should accept the possibility of fast emplacement [of granite plutons] by dykes because it’s based on good data’.11 Second, rapid solidification and cooling of granite plutons is easily explained when the cooling effects of voluminous water are considered. This includes the water rapidly expelled from the magma itself, transferring heat in the process. In addition, the pressure of the water being expelled and flashing into steam would fracture the pluton and country rock allowing the connate and ground waters to set up convection cells and continue to remove the heat.6 And finally, large volumes of floodwater moving across the earth during the global Flood explain the rapid unroofing. Figure 3. Typical granite texture showing the large mineral crystals in hand specimen. However, the issue of granite cooling does not stop there. Critics of the biblical age of the earth argue that the texture of granite means it must have cooled very slowly. Granite has a crystalline texture of interlocking mineral grains ranging from 1–5 mm (Figure 3). Usually the grains are randomly arranged with no regular bands or layers. Some granites may contain a sprinkling of larger crystals (phenocrysts) within an otherwise coarse and even-grained rock. 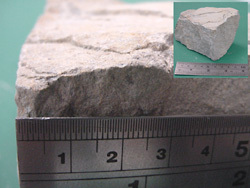 A volcanic rock of felsic composition similar to granite is rhyolite, but it has an entirely different appearance (Figure 4). The main groundmass of rhyolite is very fine-grained, with crystals so small they are not visible even with a hand lens. A few tiny but visible crystals, such as quartz and feldspar, are often scattered through the fine-grained groundmass. Flow banding, caused by the parallel alignment of the small crystals as the lava was extruded, is frequently evident. Figure 4. Typical rhyolite showing the fine-grained groundmass containing a few tiny crystals. 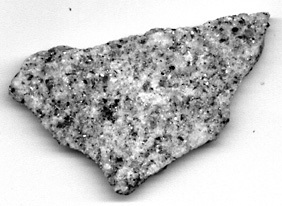 Critics argue that granites could not have formed from magma that cooled quickly in days or weeks because the resulting mineral texture would be fine-grained like rhyolite—not coarse-grained and granitic.12,13 Furthermore if the fractures in the granite provided access for cooling by fluids, they argue, there would have been a large variation in the cooling rates between the rock near the fractures and the rock further away. This should lead to a differentiated texture, with a fine-grained texture near the fractures and a course-grained texture in the parts more centrally located. But granites generally exhibit a reasonably regular coarse-grained texture, pointing to slow and steady cooling. So the objection goes. The idea that the grain size of an igneous rock is inversely related to its cooling rate is described by Wambler and Wallace14 in the Journal of Geoscience Education as a common misconception. They claim it causes students to misidentify hand specimens, infer the wrong crystallization sequences, and ignore the crucial role of volatiles in rock formation. They attribute the problem to writers of introductory geology textbooks and field guides, and recommend that, in future, writers explain how crystal size depends on many factors other than cooling rate; factors such as nucleation rate, viscosity, original composition of the melt, pressure variation and the amount of volatiles. There are many field clues that suggest grain size is not controlled solely by slow cooling over millions of years. For example, dykes are often associated with granite intrusions and these also have a granitic texture. One well known example is the dykes discovered in Scotland by James Hutton, the father of modern geology. These showed the granite had invaded the fractured country sedimentary rocks demonstrating that it had been forced into them as a liquid.15 Trezise and Stephenson provide more field examples near Townsville, Australia, of granitic dykes, one about 10 m wide.16 In such dykes the grain size is usually smaller than the grain size in the associated pluton, but the individual grains are still visible, giving the rock a sugary texture.17 Such thin dykes should have cooled much faster than a large pluton yet they still have visible crystals. The faster cooling has not produced the volcanic rock, rhyolite. Pegmatites provide another clue that crystal size is not dependent on cooling rate alone. Pegmatites have the typical appearance of igneous rocks with randomly distributed interlocking crystals such as quartz, feldspar and mica. However, pegmatites are extremely coarse-grained, customarily with crystals more than a few centimetres across but occasionally as large as 10 m!18 Usually pegmatites are associated with intrusive granitic rock bodies, commonly taking the form of large veins, dykes, sills or irregular masses.19 So, although pegmatite bodies are physically smaller than the granitic intrusions with which they are associated, and should have cooled more quickly, the mineral crystals are larger. That is the opposite of what would be expected if crystal size depended on cooling rate alone. Consequently geologists explain the larger pegmatite crystals, not due to longer cooling time, but due to different physical conditions. It is generally agreed that they formed from the last stages of the crystallizing magma within the igneous body.20,21 It is envisaged that as the magma crystallized, the residual melt became more and more concentrated in water, volatiles, alkalis and other elements, which enabled the large crystals to form. But there is more evidence for the role of fluids in pluton emplacement. The hot, rich fluids expelled from the magma as it intruded the country rock were responsible for many of the great mineral deposits in the world.22 These include igneous iron deposits and porphyry and hydrothermal deposits of copper, silver, lead, gold, molybdenum and tin, all in association with felsic intrusions. Field evidence shows that huge volumes of magmatic and hydrothermal fluids (and volatiles) were released when these plutons were emplaced. Figure 5. The domed rhyolite body at Coolum, Queensland, Australia. Long columnar jointing through the dome suggests that a large volume of lava was extruded at one time and would have cooled more slowly inside than at the surface. Yet the texture is fine-grained even inside the body. We have seen that the interpreted faster cooling of the smaller pegmatite bodies does not produce smaller crystals. Conversely, slower cooling does not necessarily produce larger crystals. Bodies of rhyolite are often relatively large (compared with veins, dykes and sills) but they still have a fine-grained volcanic texture in the middle of them. For example, a rhyolite intrusion at Coolum in Queensland is 1000 m long, 800 m wide and rises 200 m above the landscape (Figure 5).23 Yet the intrusion has a volcanic rhyolitic texture even within rock taken from inside the intrusion in a quarry. If cooling rate was the only factor affecting grain size, the inside of such a large volume of magma would cool more slowly and produce a coarser-grained texture. What are some of the factors, other than cooling rate, that affect grain size? Field evidence shows that granites are often associated with folded sedimentary rocks, suggesting crustal compression was important. 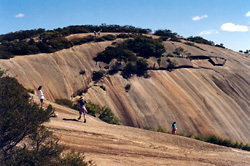 For example, the orogeny (mountain building) that uplifted and folded the sediments in part of eastern Australia, in what is known as the New England Orogen, was typically followed with the emplacement of granitic plutons and extrusive rhyolite deposits.24 Again, it has been long recognised that many ore deposits are clearly related to mountain building, which in turn is related to igneous intrusive activity.25 Uniformitarians assume compression and emplacement took tens of millions of years.24 However, when we understand that these events occurred during the catastrophic Flood,26 we realise that the processes occurred in less than one year, and may have only taken days. In this case, the dynamic forces of compression would have been huge, heating the rocks as they were compressed and producing colossal pressure changes in the magma generated by partial melting. Pressure affects a material’s melting point which in turn affects its crystallization behaviour. Specifics differ for individual materials depending on the relationship between pressure, volume, temperature, density, and entropy. Figure 6. (a) High nucleation rate and low crystal growth rate creates a product with a fine-grained texture. (b) Low nucleation rate and high growth rate generates a coarse-grained product. The science of crystallization has been developing apace because crystallization is widely used in the chemical industry, metallurgy and ceramics and so is of enormous economic importance. Today many books are available on the scientific understanding of the process.27,28 The size of crystals depends on two factors: the rate of crystal nucleation and the rate of crystal growth. Our present understanding of both these factors is still in its infancy. 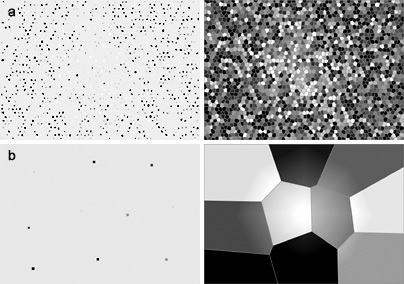 If the physical and chemical conditions are such that the rate of crystal nucleation is high and the rate of crystal growth is low, then the product will have abundant fine-grained crystals (Figure 6a). To produce large crystals, as occur in granite, the rate of nucleation needs to be low, and the rate of growth high (Figure 6b). Such a situation would be produced if the physical and chemical conditions changed rapidly, not providing time for nucleation to occur but allowing for crystal growth. Another laboratory study30 on silicate melts found crystal growth starts at nucleation sites already present before the magma cools. This produces granitic textures much faster than previously thought. Crystallization theory and practice reveals other clues that point to granite crystals having grown rapidly. First, when crystals grow rapidly they trap some of the surrounding liquid, forming fluid inclusions inside them.31 In many industrial applications it is important to grow crystals sufficiently slowly so they do not have inclusions. But mineral crystals in granite contain fluid inclusions, indicating they grew quickly, not slowly over millions of years. Second, in industrial applications, special attention is needed to prevent crystals settling.32 If the crystals in granites formed slowly over millions of years, we would expect them to have settled into layers. The layers would reflect the relative density of the crystals and the order of crystallization. There are many igneous intrusions, called cumulates, where such layering has occurred.33 The heavier, early-crystallizing minerals tend to settle out by gravity, and the resultant texture shows clear evidence of concentration by accumulation. But the crystals in granites are reasonably homogeneous throughout the pluton, suggesting the rock crystallized rapidly before the individual crystals had time to settle. Layered intrusions commonly occur with mafic intrusions where the minerals (such as olivine, pyroxene, chromite, magnetite and plagioclase) have a wider range of specific gravity, and the magma viscosity was low. But cumulates also occur in some syenitic and granitic intrusions,34,35 indicating that under appropriate conditions crystals can settle by gravity from a felsic magma. A number of different radiohalos have been identified and these can be distinguished by the different number of concentric rings present.40 The rings have been related to the 238U decay series in which eight of the isotopes in the series liberate alpha particles when they decay. The different types of radiohalos have been linked to a specific parent isotope concentrated in the ‘radiocentre’. A 210Po parent produces a single-ringed halo, a 214Po radiocentre produces a two-ringed halo, and a 218Po centre the three-ringed halo. 238U produces an eight-ringed halo. In the final analysis, geological ideas need to be tested in the field, so we will consider an example of a granite pluton. The Tatoosh pluton42 in Mt Rainier National Park, Washington State is one case where the field evidence contradicts the conventional idea that granite plutons formed from slowly cooling magma deep inside the earth. Composed of medium- to coarse-grained granodiorite, the pluton is roughly oval in shape and extends under Mount Rainier (Figure 7), a large volcano formed from andesitic lava.43 Although an area of some 130 km2 of the granite pluton is exposed at the surface, the area would be more than doubled if the lavas and glaciers of Mount Rainier were removed. Classified as Miocene by its field relationships, the pluton shows evidence of shallow emplacement and rapid cooling as follows. Figure 7. The Tatoosh pluton extends under Mt Ranier, Washington State. Detailed field characteristics imply that the magma crystallized rapidly due to dehydration under a cover so thin that volatiles streamed up through the roof. One characteristic is the presence of vertical strings of large vesicles (cavities) near the roof of the pluton. These cavities were formed by the expansion of gas bubbles during the solidification of the rock, and suggest the existence of upward streaming volatiles at that time. Some of the cavities in the rock near the roof are lined with well-developed (euhedral) crystals projecting into the spaces. The well-developed crystals point to unrestricted growth suggesting crystallization from a volatile phase which has subsequently escaped. This is supported by the fact that the crystals in the cavities are characteristic of the minerals which crystallize during the late stages of a solidifying magma, chiefly quartz. Another field characteristic that suggests crystallization due to rapid dehydration is a remarkably widespread zone of fine-grained porphyritic rock up to 100 m thick or more. This zone is adjacent to the roof of the pluton in some areas but not in others. It is difficult to explain how this zone could have been caused by chilling by simple conduction into the wall rock because we would expect the zone to be always present at the top of the pluton. The fact that it is only intermittently present indicates that the zone was produced by rapid transfer of heat and volatiles to the surface and this almost certainly was associated with volcanic activity above the pluton at the surface. The sudden, explosive liberation of the volatiles would have caused an abrupt drop in the vapour pressure, causing the remaining magma to solidify and form the thick porphyritic zone. Further evidence that the processes involved in the emplacement of the pluton were rapid and catastrophic is the presence of sharply angular rock fragments (volcanic breccia) within a large circular zone, possibly at the root of a former vent. The spaces between breccia fragments are filled with minerals such as amphibole, quartz, scapolite, magnetite and apatite, which are characteristic of deposition from the late-stage volatiles. Some 600 m below this breccia the pluton is pervaded by a fine-grained granophyre, apparently the product of a sudden and final crystallization. This evidence suggests that the violent explosion which produced the breccia liberated volatiles causing the remaining magma to crystallize suddenly. One more evidence that the magma crystallized rapidly is the almost complete absence of marked flow banding and mineral lineation throughout the pluton. This suggests that there was no prolonged period when the material moved as a viscous crystal mush. These field characteristics of the Tatoosh pluton indicate that the sudden and explosive creation of voids in the pluton, coupled with the upward streaming of volatiles, reduced the vapour pressure abruptly, speeding up solidification of the magma. This example contradicts the conventional idea that granites only form from slowly cooling magma deep inside the earth. Recent sceptic arguments citing coarse-grained granite texture as a case against rapid cooling of granites are ignoring, either wilfully or carelessly, previous creationist work which has addressed crystal size and shown it to be an invalid indicator of cooling rate.6 The claim that coarse-grained granite textures need long periods of time to form is based on a misconception—that crystal size is inversely proportional to pluton cooling rate and that large crystals develop only if they have time to grow slowly. Wampler and Wallace14 recommend that this misconception should no longer be taught. They claim it is counter productive to clear geological thinking because it discourages students from understanding the possible processes of formation. Field and experimental evidence demonstrates that crystal size depends on factors other than cooling rate. These include nucleation rate, magma viscosity, original composition of the melt, pressure variation in the magma chamber and the amount of volatiles. Relevant field evidence includes granitic dykes, pegmatites and large rhyolite bodies. In addition, laboratory experiments on granitic melts show that a granitic texture can develop in days. Furthermore, the presence of discoloration halos of the short-lived isotopes of polonium in biotites and muscovite in granite are evidence of very rapid crystallization. And finally, in a field example, the Tatoosh pluton in Washington State demonstrates that, contrary to popular ideas, pluton emplacement can be shallow and cool rapidly. In short, the coarse-grained texture of granites presents no problem for the formation of granite plutons during the one-year biblical Flood. Young, D.A., Creation and the Flood: An Alternative to Flood Geology and Theistic Evolution, Baker, Michigan, p. 184, 1977. Return to text. Hayward, A., Creation and Evolution: The Facts and Fallacies, Triangle, London, p. 93, 1985. Return to text. Blake, P., Flawed model for creationists’ ‘flood geology’, The Skeptic 20(2):16–19, 2000. Return to text. Meert, J., Radiometric dating, paleosols and the geologic column: three strikes against young Earth creationism, <gondwanaresearch.com/hp/paleosol.htm>, 24 January 2003. Return to text. Guilbert, J.M. and Park, C.F., The Geology of Ore Deposits, W.H. Freeman and Company, New York, pp. 26–43, 1986. Return to text. Snelling, A.A. and Woodmorappe, J., The cooling of thick igneous bodies on a young Earth, in: Walsh, R.E. (Ed. ), Proceedings of the Fourth International Conference on Creationism, Creation Science Fellowship, Pittsburgh, pp. 527–545, 1998. Return to text. Snelling, A.A., ‘Rapid’ granite formation?, TJ 10(2):175–177, 1996. Return to text. Snelling, A.A. and Woodmorappe, J., Rapid rocks: granites … they didn’t need millions of years of cooling, Creation 21(1):42–44, 1999. Return to text. Petford, N., Cruden, A.R., McCaffrey, K.J.W. and Vigneresse, J.-L., Granite magma formation, transport and emplacement in the Earth’s crust, Nature 408(6813):669–673, 2000. Return to text. Woodmorappe, J., The rapid formation of granitic rocks: more evidence, TJ 15(2):122–125, 2001. Return to text. Henke, K.R., Cooling magma: more distortions from Snelling and Woodmorappe, <www.geocities.com/Athens/Thebes/7755/henke/krh-coolmagma.html>, 21 March 2003. Return to text. Blake, Ref. 3, p. 18. Return to text. Blake, P., Reply from Paul Blake; in: Definitely the last word on the Bible and geology, The Australian Geologist, Newsletter 112, pp. 12–13, 30 September 1999. Return to text. Wambler, J.M. and Wallace, P., Misconceptions—a column about errors in geoscience textbooks: misconceptions of crystal growth and cooling rates in the formation of igneous rocks: the case of pegmatites and aplites, Journal of Geoscience Education 46:497–499, 1998. Return to text. Press, F. and Siever, R., Earth, 4th Ed., W.H. Freeman and Company, New York, p. 380, 1986. Return to text. Trezise, D.L. and Stephenson, P.J., Rocks and Landscapes of the Townsville District, Department of Resource Industries, Queensland, pp. 30–34, 1990. Return to text. Wright, D. and Bell, P., Practical Guide to Rocks and Minerals, Chancellor Press, London, pp. 70–71, 1985, show a range of granitic rocks commonly found as dykes and sills. Return to text. Best, M.G., Igneous and Metamorphic Petrology, W.H. Freeman and Company, New York, p. 111, 1982. Return to text. Wright and Bell, Ref. 17, pp. 66–69. Return to text. Wright and Bell, Ref. 17, p. 66. Return to text. Guilbert and Park, Ref. 5, pp. 487–489. Return to text. Guilbert and Park, Ref. 5, pp. 397–453. Return to text. Willmott, W.F. and Stevens, N.C., Rocks and Landscapes of the Sunshine Coast, Geological Society of Australia (Queensland Division), pp. 11, 30, 38, 1988. Return to text. Willmott and Stevens, Ref. 23, pp. 3–7, 13. See also Willmott, W.F. and Stevens, N.C., Rocks and Landscapes of Brisbane and Ipswich, Geological Society of Australia, Queensland Division, pp. 3–7, 13, 30, 38, 1992. Return to text. Guilbert and Park, Ref. 5, pp. 397–398. Return to text. The rocks in eastern Australia, for example, have been shown to have been deposited during the Flood in, Walker, T.B., The basement rocks of the Brisbane area, Australia: where do they fit in the creation model? 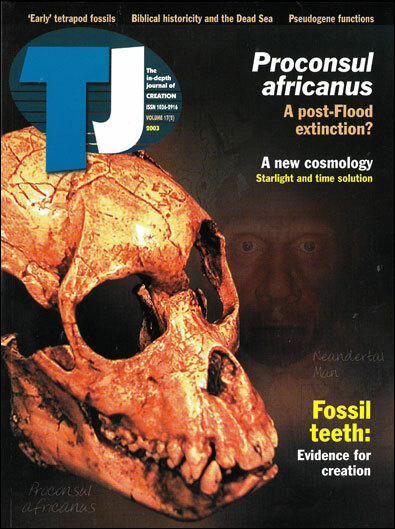 TJ 10(2):241–257, 1996, and Walker, T.B., The Great Artesian Basin, Australia, TJ 10(3):379–390, 1996. Return to text. Mersmann, A. (Ed. ), Crystallization Technology Handbook, 2nd Ed., Marcel Dekker, New York, 2001. Return to text. Mullin, J.W., Crystallization, 4th Ed., Butterworth Heinemann, Oxford, 2001. Return to text. Swanson, S.E., Relation of nucleation and crystal growth rate to the development of granitic textures, American Mineralogist 62:966–978, 1977. Return to text. Lofgren, G., Experimental studies on the dynamic crystallization of silicate melts; in: Hargraves, R.B. (Ed. ), Physics of Magmatic Processes, Princeton University Press, Princeton, pp. 487–552, 1980. Return to text. Mersmann, Ref. 27, p. 621. Return to text. Mullin, Ref. 28, pp. 451–459. Return to text. Philpotts, A.R., Principles of Igneous and Metamorphic Petrology, Prentice Hall, Englewood Cliffs, NJ, pp. 247–252, 1990. Return to text. Philpotts, Ref. 33, p. 248. Return to text. Dorais, M.J., Lira, R., Chen, Y. and Tingey, D., Origin of biotite-apatite-rich enclaves, Achala batholith, Argentina, Contributions to Mineralogy and Petrology 130(1):31–46, 1997, infer that in spite of the granitic composition of the melt, the viscosity was lowered sufficiently to allow cumulates to form. Return to text. Gentry, R.V., Creation’s Tiny Mystery, Earth Science Associates, Knoxville, pp. 111–137, 1988. Return to text. Walker, T.B., New radiohalo find challenges primordial granite claim, TJ 15(1):14–16, 2001. Return to text. Armitage, M., Internal radiohalos in a diamond, TJ 9(1):93–101, 1995. Return to text. Armitage, M. and Back, E., The thermal erasure of radiohalos in biotite, TJ 8(2):212–222, 1994. Return to text. Gentry, Ref. 36, p. 278. Return to text. Snelling, A.A., Radiohalos—significant and exciting research results, Impact 353, ICR, El Cajon, 2002. Return to text. Fiske, R.S., Hopson, C.A. and Waters, A.C., Geology of Mount Rainier National Park Washington: Washington, United States Geological Survey Professional Paper 444, 1963, pp. 40–47. Return to text. Geological details are from Fiske et al., Ref. 42, pp. 40–47. Return to text. Day, R.W., Whitaker, W.G., Murray, C.G., Wilson, I.H. & Grimes K.G., Queensland Geology. A companion volume to the 1:2,500,000 scale geological map (1975), Geological Survey of Queensland Publication 383, 1983. Return to text.